A set of core values makes it easier for everyone to navigate behavioral expectations at Intercom, and for individuals to see how they might thrive here. As head of the Brand Studio, I’ve watched our team scale in a very short period of time. Defining a small set of true values is key to making sure teams like ours can grow and adapt quickly, without the need for demoralizing micromanagement. With this first iteration of the Brand Studio values, we’re optimizing for things that can easily be used to guide important decisions. Once aligned, the next steps are to weave these values into our branding, hiring, leveling, process work and performance reviews. We use these values to define success in terms of expected behavior from members of the team. They should also help empower us to understand more about the business we are helping create and the product we are building. Why it’s important to our customers and what our role in overall business success and health is. These are our values. They provide guidance on how we do what we do. How we communicate, how we carry ourselves and how we treat each other. They are not platitudes and they are not written in reflection of who we want to be and what we should strive for. We do many of these things already. We could likely do all of these things better and better over time. They are important because they force hard decisions. We want to build from a foundation of optimism, passion and positivity. We understand the power of being vulnerable. We acknowledge when someone’s idea is better. When we mess up, we say so. We ask for help when we need it. We listen more than we talk. We sacrifice our own egos for the benefit of the team, for the benefit of the work and for the benefit of Intercom. Our culture is inclusive. No one is left out or left behind. Why this matters: We are building a brand and product for everyone. When we exclude people and/or ideas, we limit ourselves, our opportunities to learn and consequently our ability to grow both the company and as individuals. We like to experiment and play, taking deliberate and considered risks. We expect that when we do, we’ll often fail. In order to foster an environment of innovation, we need to be prepared to sometimes fail or come up short. When we do that and then apportion blame or apply hindsight bias, we minimize our ability to take those risks again and subsequently also minimize our potential. We hold each other accountable. Both in behavior and in performance. We have much to learn from each other and the diversity of our backgrounds and experiences. We ask questions and offer context. Why this matters: We deliberately hire people who have demonstrated potential, appetite and ability to grow. It’s in our mutual interests to strive for and push others to grow, and become more impactful in their jobs and careers. We like people who are confident yet humble. And people who are honest and self-aware. We love people who are kind and open-minded. We respect people who reject mediocrity and hold a very high bar for themselves and others. We love the people who genuinely want to learn and grow. Who solicit feedback from others and offer feedback to others. We value these behaviors and attitudes especially highly within design. Why? Our mission and challenge is very hard. Most similar companies fail. To succeed we need people who are optimists, are dreamers, are the people who try to make the impossible probable. We also are mindful of the impact our words and actions have. We need people who make hard work fun, who make learning hard lessons fun. We are always, always, always kind. No exceptions. We give away credit easily when things go well, and we accept responsibility when things go wrong. If we touch a project in any way, we assume responsibility for that project when things get a little rocky, lest we shake ourselves apart. Everything we do is in support of Intercom’s mission “to make internet business personal.” We strive to create original work, yet we acknowledge that the most original work is not always the most successful. We strive to find a balance between art and science. We design for our clients within Intercom and for Intercom’s customers, not for ourselves or other designers. Our success is measured with the same business metrics that the rest of the company uses. Why this matters: We reject the status quo and never just copy others by default. We love creativity and intuition. We want to encourage risk taking and for every person to be their best creative selves. We strive to create space for experimentation and encourage exploring a variety of potential solutions to deeply understood problems. The easy path is to follow trends and do something that resonates within the design and tech communities. The harder path is the one that looks for us to create work that not only positions the Intercom brand as innovative, new, modern and fresh but also resonates with customers and what they look for in Intercom as a solution to growing their businesses. We want to build a valuable company that will last many years and to do that, there will often be trade offs. We push forward where we can, yet pull back where it makes sense. We embrace the design and communication challenge of rendering our intent within a set of constraints. We are curious about the company that we are building and the world around us. We seek out opportunities to learn and understand more about what we do and why we do it. We are never cynical. Every project is an opportunity to try something new. To understand something deeper. To get to know someone better. Why this matters: We love to invent and do things for the first time. We’re optimistic. We’re passionate and positive. We love people who believe everything is possible. We should never be afraid to ship forward thinking work. We ship ambitious projects as a series of small, safe steps. We ship good work early, learning and iterating as we go. We seek feedback early and often. Transparency and a spotlight reveal potential weak points and things that we can make better. Only the fittest companies – those that can move, learn and evolve fast – survive. The natural, default path is for us to get slower as we get bigger and older. We need to consciously and deliberately make good decisions, tradeoffs and investments of time such that we defend and improve our ability to move fast for the long term. We align behind “just enough process.” Fighting against complexity that can slow us down. Yet we also recognize when going slow now means going further and faster later. Know when and how to be scrappy. We like to think long-term and never optimize for the short-term. We should all actively seek out opportunities to learn more about our product, how and why we build it and seek to learn from how others approach those problems. We work for and with every other team in the company and we should use every opportunity available to understand them, their challenges and how they contribute to the business. We do so with an open mind and open heart, never with cynicism. We don’t criticize what other companies are doing as they, no doubt, face many of the same challenges as we do. Again…we’re optimistic. We’re passionate and positive. These values are here to be discussed, debated and evolved. They are all of ours to own and feedback is not only welcomed, it’s expected. I want the Intercom Brand Studio to be the place where we can do the best work of our careers. And when the time comes to move on (as it will for all of us sooner or later), we can do so with infinite possibilities and opportunities ahead of us. 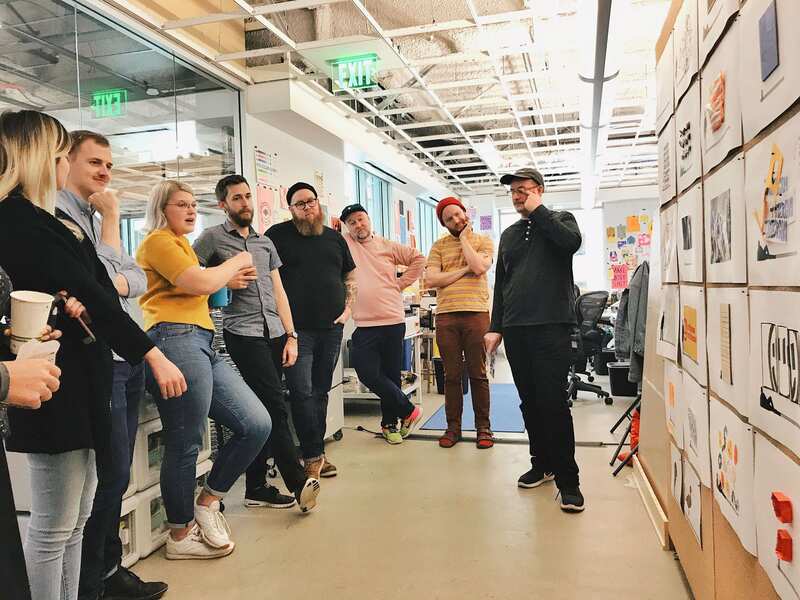 Thanks to the Brand Studio team: Chelsea, Justin, Brooks, Liz, Dani, Matt, Kyle, Tim, Lily, Sebastian, Judson, Kelly, Olenka, Carly, Jason and August for their critical input. An extra special thanks to Rich Archbold and Des Traynor for their mentorship. This post was first published on Medium. Do these values resonate with you? Check out career opportunities with the Brand Studio!